When undertaking any home improvement project, it is important for you to determine what kind of results you are aiming for. The best way to do this is to ask yourself some questions; the answers, no matter what they are, can help you narrow down your wide range of options and ensure that you get exactly what you want. When it comes to deciding on a design for a residential awning, the process is no different. Here are the questions you should ask yourself before having your residential awning installed. What Kind of Material Do I Want? The different materials of residential awnings can all give your awning a unique look. Depending on how you want to customize your choice, you could select from woven acrylic fabric options, vinyl laminates, or coated cottons. Treated fabrics are able to withstand the wind and weather, so the type you choose is really a matter of personal taste. Do I Want Certain Colors or Patterns? Do I Want a Stationary or Retractable Awning? Residential awnings can come in either of these varieties, so think about your home’s specific needs. If you are installing the awning over an area that is constantly in the sun, a stationary awning could provide consistent shade. If you want the option to adjust your awning as needed, a retractable one might be the choice for you. Once you’ve answered these simple questions, you’re ready to get your very own residential awning installed! Carroll Awning Company has unmatched qualities on awnings and stylish awning frames for both residential and business purposes. 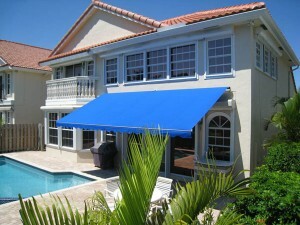 Let Carroll Awning Company help you decorate your property with awnings and reduce your energy costs today. Retractable awnings will reduce heat loss during the cold months of winter and protect your property from heat gain during the hot days of summer. We offer any type of awnings you may need, from freestanding canopies to compact domes. Choose fabrics in stripes, solids or patterns. All are suited for UV resistance. Through our combined locations and experience, Carroll Awning Company provides innovative craftsmanship, superb service, competitive pricing and unfailing attention to details in order to deliver a product that exceeds expectations.